Heat oven to 325°F. Grease or spray 13x9-inch pan. In large bowl, beat brown sugar, butter, vanilla, almond extract and eggs with electric mixer on medium speed until light and fluffy. On low speed, beat in flour, baking powder and salt until well blended. Set aside 1/4 cup of white chocolate bar chunks. 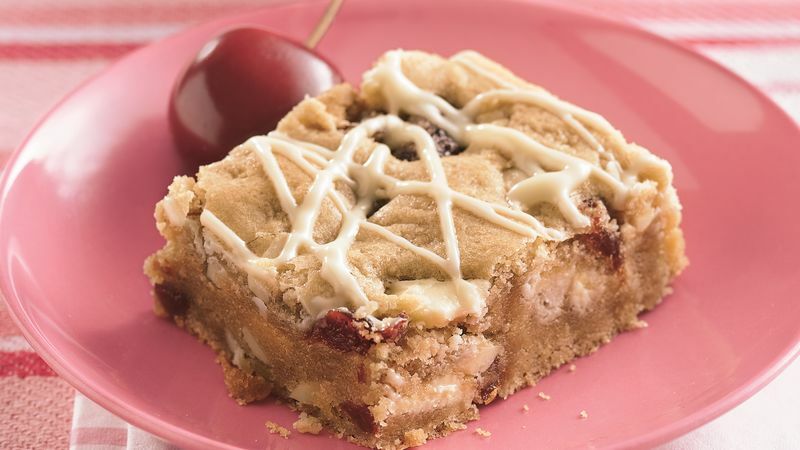 Stir in remaining chunks, almonds and cherries. Spread batter evenly in pan. Bake 35 to 40 minutes or until top is golden brown and set. Cool completely, about 1 hour. In small microwavable bowl, microwave reserved white chocolate bar chunks and oil uncovered on High 30 to 60 seconds, stirring every 15 seconds, until melted; stir well. Drizzle glaze over bars. Or if desired, place glaze in small food-storage plastic bag and cut off small tip from one corner of bag; drizzle glaze in diagonal lines over bars. Let stand until glaze is set, about 3 hours. For bars, cut into 6 rows by 6 rows. The slivered almonds can be whole or chopped, or left out completely, if you like. To make cutting the bars easier, line the pan with foil, and then grease the foil. Bake the bars in the foil-lined pan. When the bars are cool, use the foil to lift them from the pan and place on a flat surface for cutting.